Does the joint have to carry a structural load? What type of wood or wood product are you fixing? What are you fixing it to? Is the overall product loadbearing? What are the different types of fixings? Connectors, such as metal plate fasteners, which carry the load at the surface of each member. Joints can be fixed by other methods, such as adhesives or carpentry and joinery techniques or by a combination of methods. Generally, bolts and dowels are heavier duty fasteners than screws or nails, and have the greatest individual load-bearing capacity. Screws are normally chosen instead of nails for their demountability and better pull-out resistance. If the joint has to carry a structural load, the design must be checked by a structural engineer. Structural design follows BS EN 1995, part of Eurocode 5: Design of timber structures. Nails are used primarily for connecting timber, steel or wood-based panel products together, sometimes in conjunction with flat or shaped metal fittings, typically in timber frame stud walls and floor diaphragms. The most common is the round wire nail. Nails with a square cross-section are also suitable for similar applications. Oval nails are often used to reduce the risk of splitting the wood. Pre-drilling holes for larger nails may be necessary when driving into dense hardwoods, or to prevent splitting in softwoods such as larch and Douglas fir. The hole diameter should be less than 80% of the nail diameter. Galvanised nails, or those with other forms of coatings, have greater corrosion resistance than uncoated nails, which in turn can have a small effect on the loadbearing capacity. Although wood screws can be used for plain timber-to-timber joints, they are especially suitable for steel-to-timber and panel-to-timber joints. Insert screws by turning, not by driving with a hammer, which will reduce the load-carrying capacity. The diameter of a screw is measured on the smooth part of the shank, or the outer edge of the thread, and ranges from 6mm to 20mm for coach screws, and from 4mm to 8mm for countersunk screws. The root diameter of most screws in the threaded portion is about 70% of the outer diameter. The depth of the thread varies from 0.125d to 0.140d and the thread pitch from 0.4d to 0.5d (d being the diameter of the screw). The length of the threaded portion is normally about 60% of the total length of the shank. Pre-drill for screws with a diameter greater than 5mm to prevent splitting the wood. Pre-drill and use washers for coach screws, which are available in lengths of 25mm to 300mm. In large connections, they hold timber connectors conveniently in place or replace bolts when only single-sided access is available. Bolts and dowels are used to hold two or more members together to form a joint, generally loaded in shear (across the fastener). Bolts are usually made from mild steel with a minimum tensile strength of 400N/mm2. The most common diameters for use with wood range from 8mm to 30mm. A typical bolt size is M8, meaning metric 8mm diameter. When installing a bolt, pre-drill the hole up to 1mm larger than the bolt to allow for easy insertion and to reduce the risk that the wood will split on assembly or after drying out. Bolts should be tightened so that the members fit closely. If the wood shrinks in service, the bolts should be retightened. Always use a washer under any head or nut in contact with the timber or steel. The diameter of the washer should be at least three times the bolt’s. Its thickness should be at least 0.3 times the bolt’s diameter. Some wood species, such as black walnut, Douglas fir, oak, teak and western red cedar, react with iron to form a black compound that stains the wood. You will need to use fixings with a low iron content, such as stainless steel. 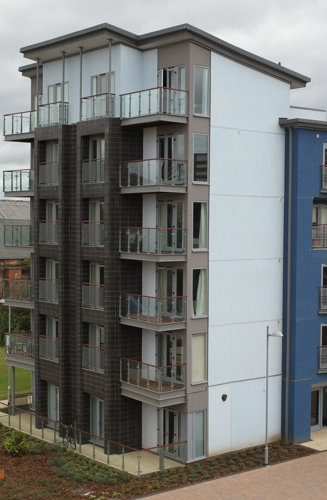 Hidden fasteners are often used for projects such as decking and cladding, where appearance is key. Not all are suitable for every type of wood, so it is essential to follow the manufacturer’s guidelines. Because they allow for closer fitting of boards, concealed clips should only be used with timber with a moisture content of 16% or less to avoid problems caused by the natural movement of the wood. Dowels are generally smooth (but some are ribbed), and available in diameters typically from 6mm to 30mm. Timber-to-timber joints made with dowels look better than bolted joints and are also stiffer, because dowels are ‘snug’ fitted whereas bolts are ‘loose’ fitting in the hole. Pre-drill holes with a diameter not greater than the dowel itself, taking care to position them accurately. The most common approach is to restrain the members in their assembled positions and drill through all the members at once. If steel members are incorporated in a dowelled joint, the holes in the steel members must include a clearance, and due allowance should be made for any extra slip that may occur as a result. Timber engineered connections are possible in which dowel heads are welded to steel plates. In large dowelled connections it may be necessary to replace some of the dowels with threaded bolts in order to stop the joint from opening laterally. The values for spacings and edge distances vary from one fastener type to another, as well as between the various material types and should be designed by an engineer. Dowel-type fasteners must be spaced at suitable distances from each other and from the ends and edges of timber or wood-based materials to avoid splitting. 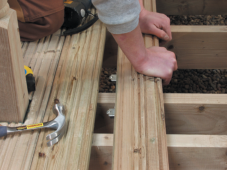 Connectors are widely used in place of traditional carpentry joints to connect timber members together, usually in conjunction with a dowel-type fastener. Easy yo use, they are readily available and do no require complex timber machining. Common types include joist hangers, framing anchors, truss clips and wall ties made of steel plate, sheet or strip. Mass-produced connectors are usually made form pre-galvanised mild steel, 1mm to 3mm thick. Heavier components, up to 12mm thick, are available for larger structures. Some manufacturers also supply stainless steel components to order. 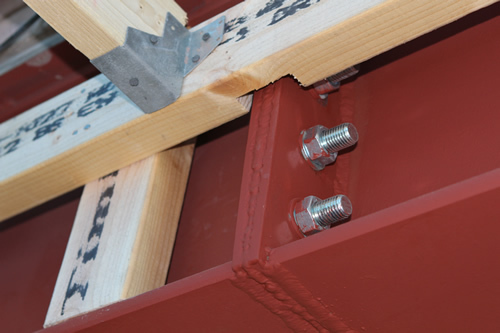 Punched metal plate fasteners are suited to factory prefabrication and transfer member forces with smaller connection areas than hand-nailed plates. 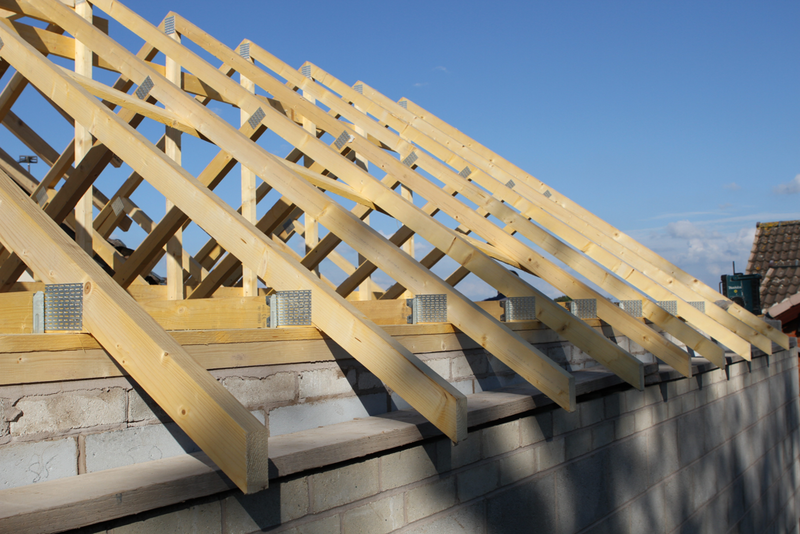 They are widely used with trussed rafters, but also for in-plane joints in other components. Take care in handling, as the joints are flexible out of plane and can be damaged during erection. These are widely available for many applications, such as joist hangers, as brackets, or as multi-angled connectors. They can be face-mounted or fitted over a girder as ‘stirrup-type’ hangers. Follow the manufacturer’s instructions and loading guidelines when fixing them. Using the correct number of nails, screws or bolts, and fixing them in the right way, is essential to avoid potential failure. 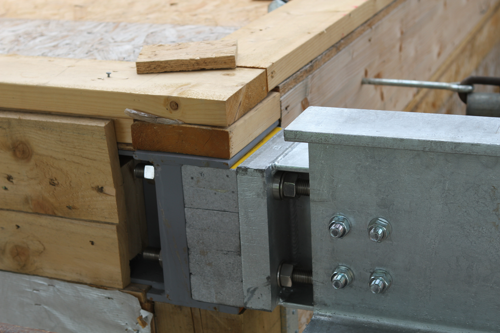 Bolted connectors can sometimes be useful in particular situations, such as site-assembled timber-to-timber joints. These connecters transfer any load directly between the surfaces of the connecting members. The strength of the connection often depends on the density of the timber. 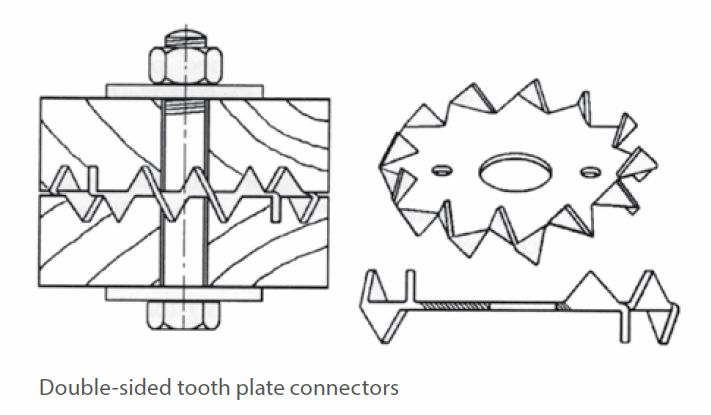 Toothed-plate connectors, for example, cannot easily be used in hardwoods. Flooring What timber treatment do I need?